What’s a good effect size index for comparing the means of two groups? How about the standardized mean difference? This effect size index very simple to calculate. You subtract the mean of one group from the mean of the other then divide the result by either the standard deviation of the control group (giving you a Glass’s Δ) or by the pooled standard deviation of both groups (giving you Cohen’s d or Hedges’ g depending on the pooling equation used). You can do this by hand or, easier still, just plug your numbers into an online calculator such as this one. 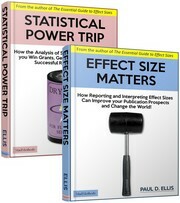 For more, see The Essential Guide to Effect Sizes, chapter 1. This entry was posted on Monday, May 31st, 2010 at 2:10 am and is filed under effect size, effect size calculators. You can follow any responses to this entry through the RSS 2.0 feed. Both comments and pings are currently closed.